Ok so frankly I haven’t cooked anything really blog-worthy recently. 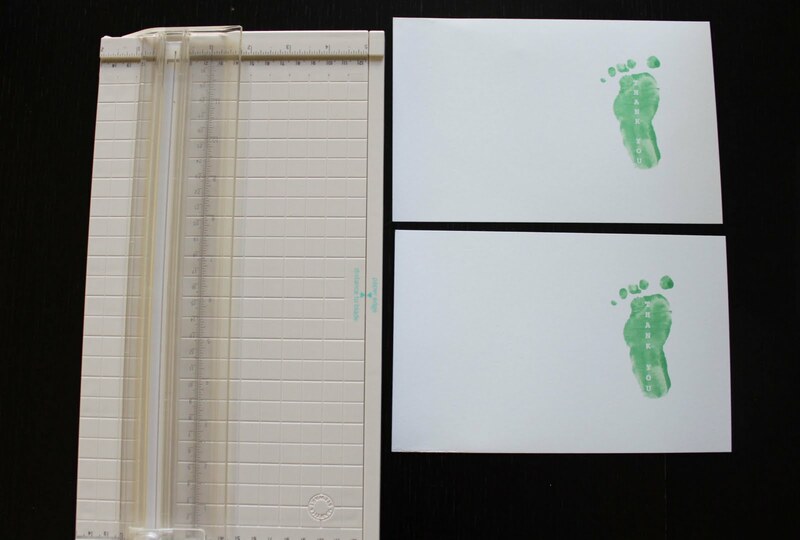 So instead I’m going to post a tutorial on how to make baby footprint thank you notes. 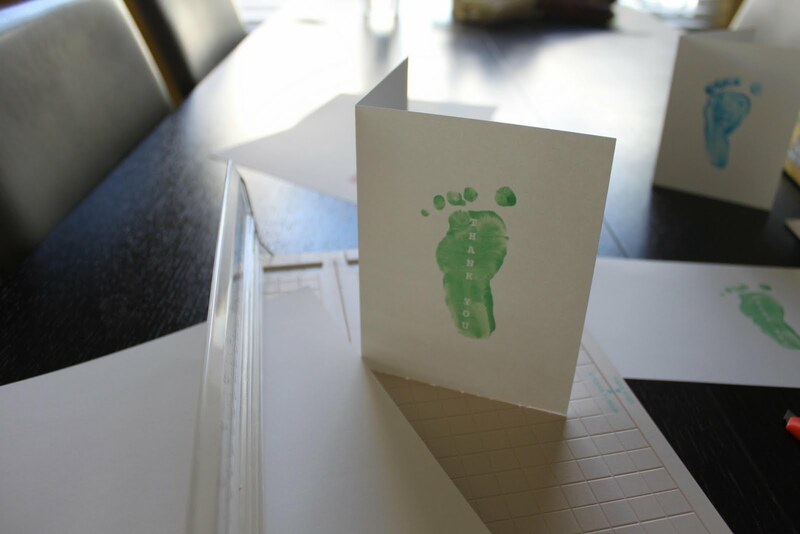 I ran out of the baby boy thank you notes I got at Target, and even though Quentin is almost 5 months old, he’s still receiving gifts that we need to write thank you notes for (he’s so spoiled!). So I decided, instead of heading back out to Target to get more thank yous, I would attempt to make a more personal version. 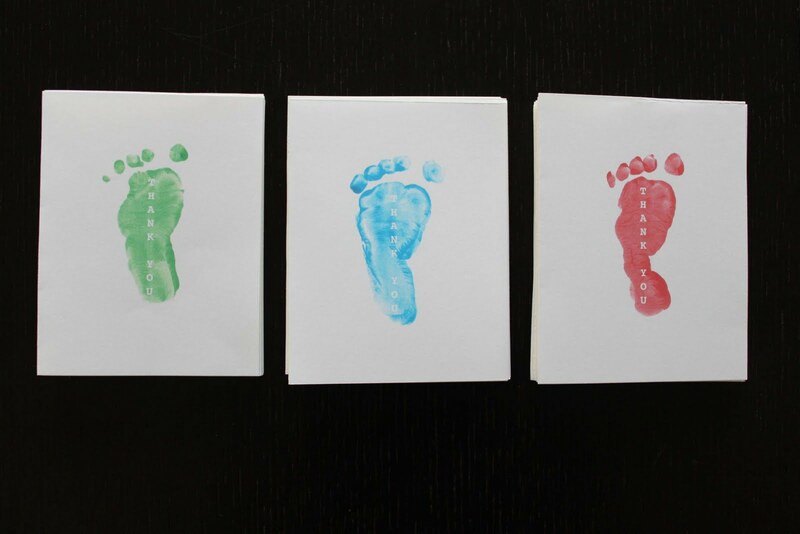 Surprisingly enough, these are not pinterest-inspired. (If you don’t know what pinterest is, you’re missing out…email me for an invite!). While I would guess these have been done before, I came up with the idea all on my own! 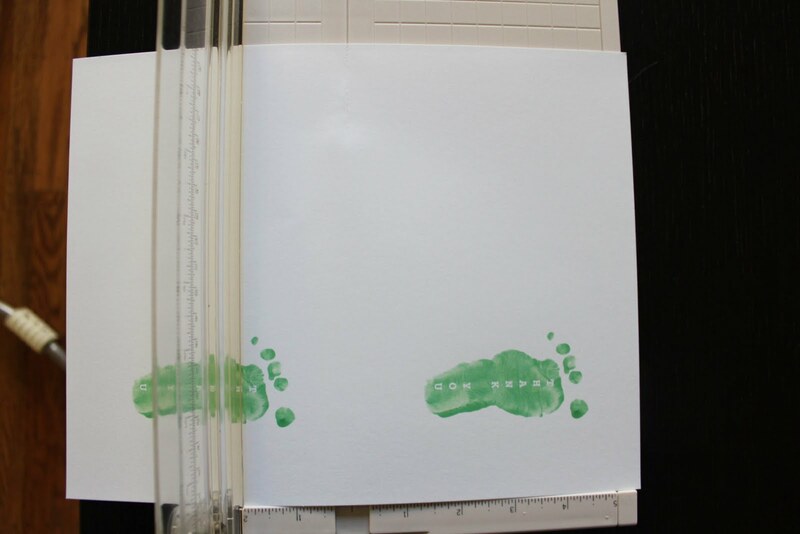 I used washable paint to make imprints of Quentin’s feet. It took 3 tries for each color to get a decent print. 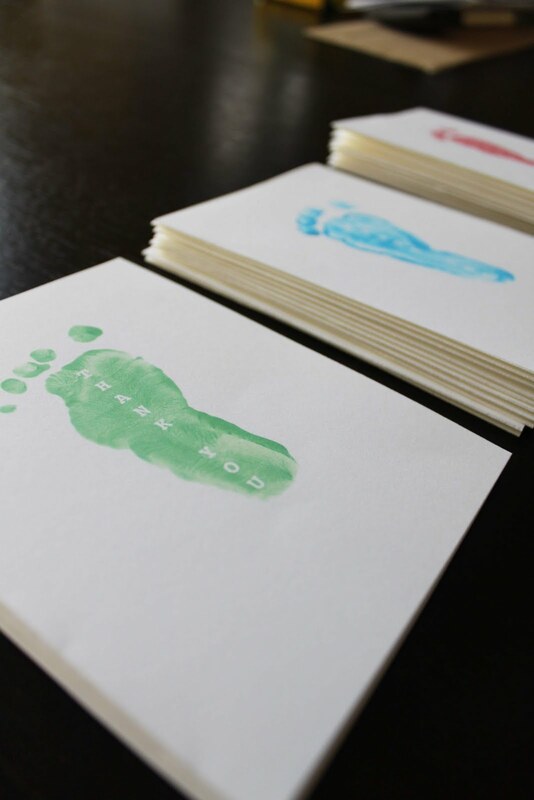 I originally wanted to do this project with his handprint, but without a second person to hold his hand open for me, this was totally out of the question! 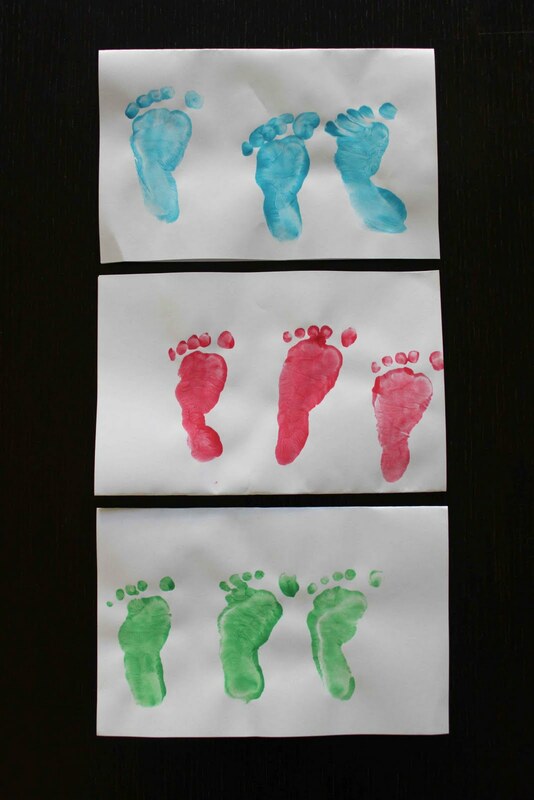 Once the footprints dried, I scanned them into the computer and chose the best version of each color. I copied and pasted them into a “Pages” document (we’re a Mac family, but I’m sure you can do this with Word). 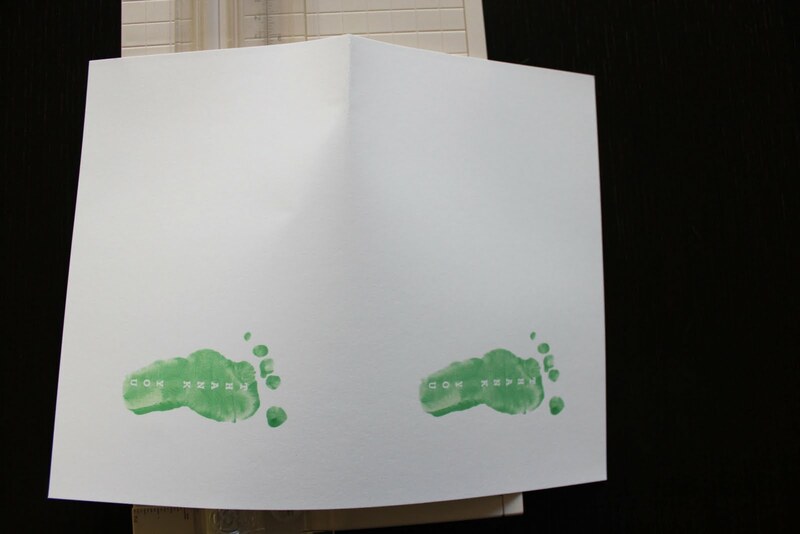 Each page got 2 footprints, on the right side of the doc. Then I added a text box and wrote “Thank you” vertically and changed the color to white. I thought about doing red font for the green footprint and green font for the red footprint, but decided I liked the look of white better. I had to do a little testing on regular printer paper to make sure everything was centered correctly for when I cut and folded my cards. Once that was done, I printed several copies onto cardstock. In order to find the exact middle of the paper, I just folded it in half and creased the edge of the paper. I realize that I could have just measured and marked the middle, but for some reason when I did that the fold was always just a tad off. Hence the folding method. Then I folded the paper flat, and cut it using a paper cutter. I creased the edge of the paper in half again to find the middle. 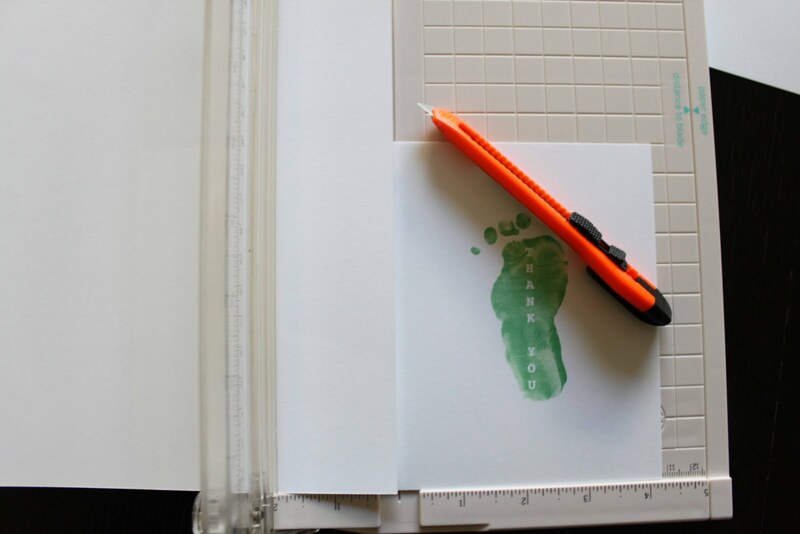 And using a blank sheet of cardstock to make sure I kept my line straight, I made a light but firm score in the cardstock using a box cutter. 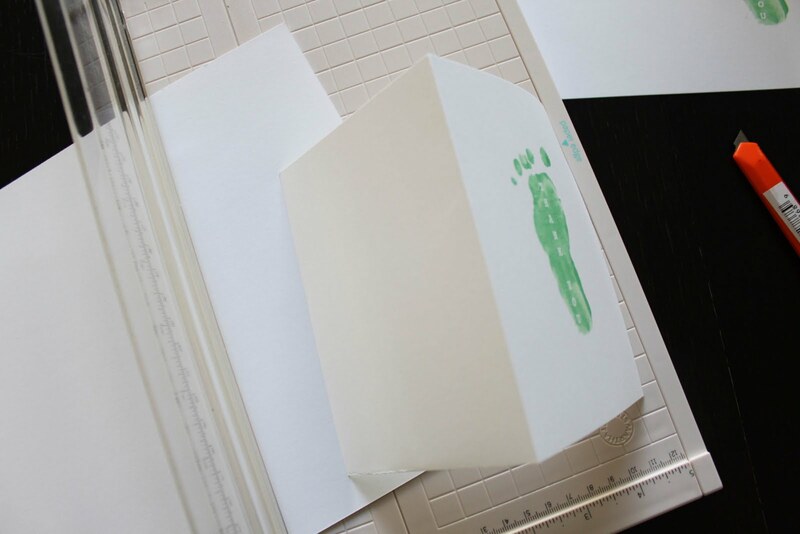 You should use just enough so that the paper folds cleanly and easily, but not enough that you cut through it (obviously). You can skip this and just fold it in half, but the results wont look as professional. Hope you enjoyed this. I’m thinking about branching out and including more DIY type posts here if people like them. Feel free to give me feedback on what you would think of these posts. And in case I don’t get back onto fraises et tartines before next Thursday, Happy Thanksgiving! 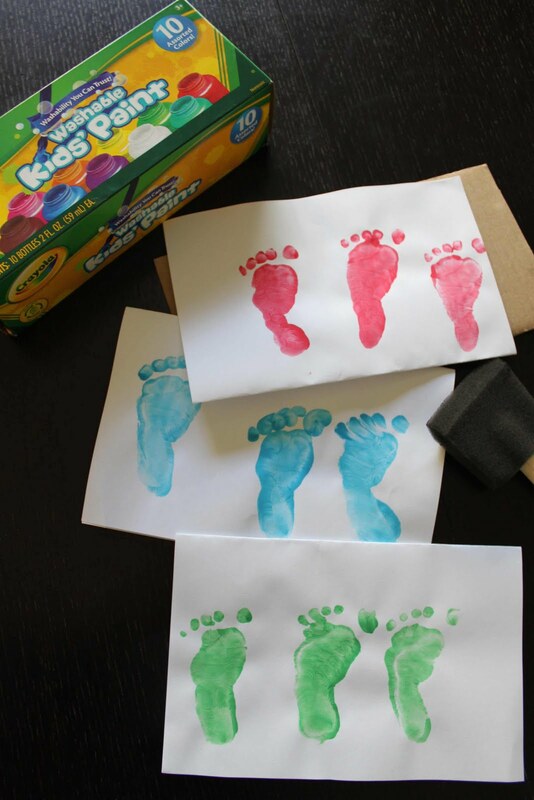 This entry was posted in baby-related, DIY project on November 17, 2011 by seedsowingmama.